Lifting the crude oil export ban will help reverse the downturn in employment and business activity experienced by suppliers of equipment, products and services to crude oil drilling operations, a prominent pump manufacturer told a U.S. House Committee recently. 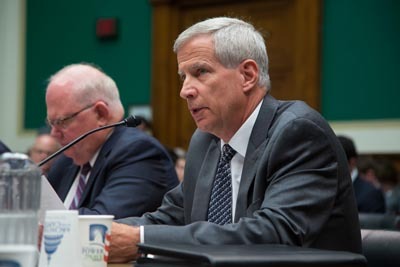 Mark Kreinbihl, Group President of Gorman-Rupp Company of Mansfield, Ohio testified to the House Subcommittee on Energy and Power in favor of a bill under consideration that would repeal the 1970s-era prohibition on exporting domestically-produced crude oil. he noted. Gorman-Rupps pumps are used extensively in hydraulic fracturing-related crude oil production operations. he told the committee, noting that I put my companys example forward as typical of what is happening in tens of thousands of energy supply chain companies throughout the United States. The Energy and Power Subcommittee is the committee responsible for moving the legislation through the House of Representatives. The bills sponsor, Texas Congressman Joe Barton noted after the hearing that he has been joined by nearly one hundred bill co-sponsors, including a substantial number of both Republicans and Democrats. In connection with the hearing, EEIA coordinated a letter in support of lifting the export ban, co-signed by twenty-three national trade associations and two major construction labor unions, representing energy supply chain industries and workers. The letter was incorporated into the Committees official hearing record.